These spring rolls were course 2 in a Vietnamese feast for my dad's birthday. My dad and sister ate a lot of spring rolls while in Vietnam. My sister told me that in some places, the rice paper wrappers were served hard, not soaked and softened like I read about online. I decided to go with softened wrappers. - Chicken: thinly sliced, seasoned with salt and pepper, tossed with olive oil, ginger, and cilantro and sauteed. - Shrimp: tossed with ginger and cilantro, sauteed in olive oil. Before making the rolls, heat water in a large, flat pot/pan. Holding the paper at one side, dip it into the water until the entire thing is covered. Be careful to keep it from folding as it gets very sticky. Place softened paper flat on a plate. Step 1 (top left): Place your ingredients near one end of the paper, and in a long, piled stack. She chose carrots, cucumbers, cabbage, mint, cilantro, and chicken. Don't put too many things in your pile - Jon made this mistake and ended up eating it like a salad! Step 2 (top right): Fold the near end over the ingredients, covering totally. 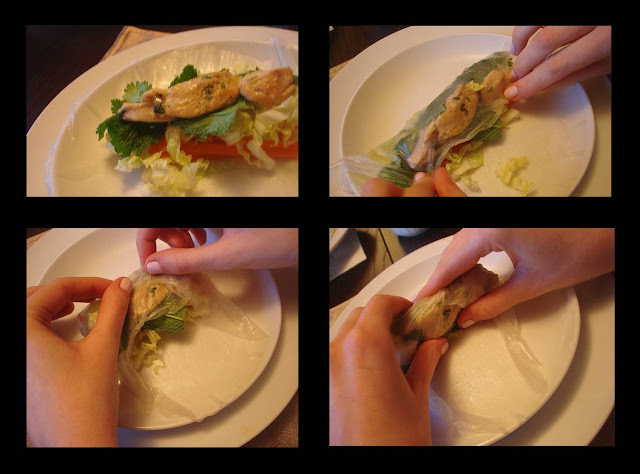 Step 4 (bottom right); push the ingredients into the roll as you start to roll it toward yourself. This keeps everything tight and in place. The finished roll - she's pretty good! These little rolls are full of fresh and healthy ingredients, and I prefer them over the fried version. I have some leftover ingredients, so tonight I think I'm going to saute some tofu to use with the veggies in a few rolls. We took a little break from eating between this course and our final course...this is a lot of food! But everything is so light and healthy that you don't feel uncomfortably full. Up next, grilled marinated pork chops and stir fried spicy broccolini.